Since the articles about Awarua Radio’s wartime activities were published in the June and July 1992 issues of Break-In, things have changed significantly in that Awarua Radio has now closed for good. This concludes the chapter on the three similar high-powered low frequency coastal radio stations that were built by the German Telefunken Company just prior to World War I, one at Awarua near Bluff, one at Awanui near Kaitaia, and one in German Samoa (now Western Samoa). There has been some feedback about the articles, and some interesting contacts have been made. Ray ZL2BMD has put me right on the TEAL flying boats crossing the Tasman at that time; they were Short “Empire” class aircraft, not Solents as I had incorrectly recorded. He also cleared up the mystery of the missing flying boat ZKAMB which had been ordered but never came to New Zealand, as it had been diverted to service in the United Kingdom, retaining its original New Zealand callsign. 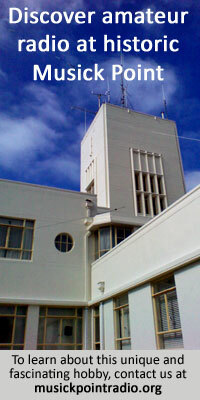 George ZL2THQ advised that Telecom would be opening a museum in the old Herd Street Post Office building in Wellington, and that the HFDF set DFG 24/2 which was in use at Awarua Radio during the war would be on display. Sadly, the museum did not eventuate as the building has been sold for demolition and the contents dispersed elsewhere into storage. 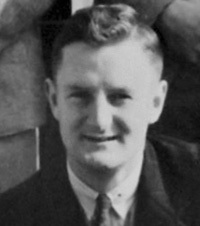 John ZL1AYZ shed light with recently released information on the interception, copying, and code-breaking of Japanese signals by the Australians, notably the RAAF. This developed into a major effort and gave an insight into their previously embargoed set-up. Ron Brazier, a member of the New Zealand Aviation Historical Society has produced some photographs, which give an excellent representation of the type of enemy submarines and aircraft that operated around the New Zealand coast World War II. 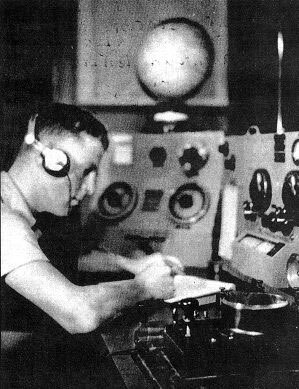 Lew ZL2IC, formerly a fellow operator on the same HFDF watch as myself at Awarua Radio, came forward with clippings and information on the Japanese submarine activity around the New Zealand coast. Sorting through all this new information, a clear picture now emerges of Japanese submarine and aerial reconnaissance around New Zealand, and it is these activities that will be recorded. During World War II, New Zealand was fortunate that the seemingly irresistible southward advance of the Japanese Imperial Forces was stopped at the naval battle of the Coral Sea in May 1942. Nevertheless, Japanese submarines launched a reconnaissance plane over Wellington and Auckland looking for naval targets. Fortunately for us they found nothing worthy of their attention. The New Zealand Radio Direction Finding Network, along with other Pacific-wide D/F Stations was responsible for monitoring enemy radio frequencies, and it is interesting to follow the progress of these vessels, from the New Zealand perspective. Figure 1. 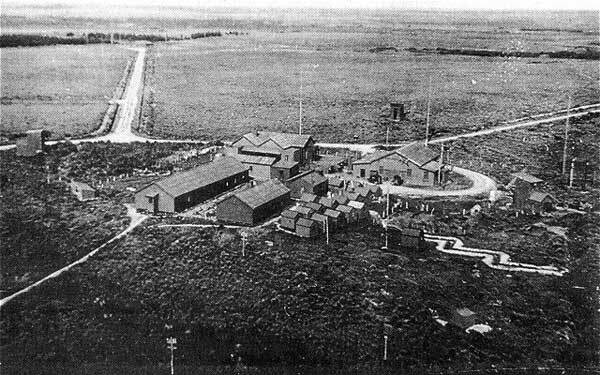 A wartime (1942) photograph of Awarua Radio (ZLB) showing the transmitting building, the living and domestic quarters, and the Army guards encampment. The road to the left leads to the recently built Receiving Office in the distance, and the road to the right leads to the HF DF stations, an even further distance. Clearly visible are the three massive concrete anchors for the 400′ mast of the original Telefunken spark transmitter. As can be seen the ground is flat and swampy in parts. The I-25 having recovered its plane, moved up to the Bay of Plenty where it repeated the reconnaissance over Auckland Harbour on the night of March 13. Again, no targets were sighted. The 1-25 then travelled to Fiji and reconnoitred Suva harbour before returning to its base in Truk, in the Caroline Islands. The submarine evidently maintained strict radio silence throughout the voyage, as there is no record of any signals being intercepted. Figure 2. Japanese WW 11 submarine 1-26, sister vessel to the aircraft-carrying 1-21 and 1-25 which flew their planes over Auckland and Wellington in March and May 1942. These vessels were large, long-range patrol submarines of 2500 to 3000 tonnes, powered by 12,000 hp diesels and capable of 23 knots on the surface. However, they were slow to dive, and sluggish underwater with a speed of around eight knots. They carried a crew of 100. At the beginning of May 1942, two I class submarines carrying floatplanes left their base in Truk: the I-21 to check out Noumea, Suva and Auckland, and the I-29 to keep watch on Sydney Harbour. The 1-21 looked at Noumea and then Suva where its plane had spotted some naval vessels. The submarine then headed for Auckland and, en route, it sent a radio message to its base reporting on the shipping in Suva Harbour. This message was copied by Allied listening posts and passed on to the Fleet Radio Unit in Melbourne (FRUMEL), where the Americans, who had succeeded in breaking the Japanese Naval code, were able to decypher it. The FRUMEL unit was formed from the US Navy Radio section at Corrigidor in the Philippines, which had been evacuated to Melbourne. Later, on May 26, a “fix” was obtained by the New Zealand D/F stations on a Japanese vessel (presumably the 1-21) about 550 miles northwest of Auckland. The Japanese used RSN/ as the callsign for their submarines, with the Katikana character known as “N Bar” being formulated as “dah, dit, dah, dah, dah”. Figure 3. The “Glen” floatplane which overflew Auckland and Wellington, was a low wing two-man plane with a 340 hp radial engine, giving a maximum top speed of 150 mph. 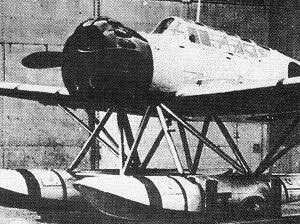 The wings and floats were taken off and the tall folded for stowing in a watertight hangar on the foredeck of the submarine. Later again, on May 29, strong signals were picked up by the New Zealand D/Fs and the resultant “fix” gave the position as 40 miles East-South-East of Sydney. These bearings were passed on immediately through the normal channel to the US Pacific Fleet HQ in Hawaii and presumably by them to Sydney. On May 31 the well-documented midget submarine raid on Sydney Harbour took place, with no significant damage to shipping, and with the loss of the midget submarines and crew entering the harbour. The attack came as a complete surprise and the harbour was lucky to escape with very light damage. The midget submarines were first thought to have been released, all three of them, from a large “mother” submarine, or surface submarine tender, but are now known to have come from three I-class submarines each carrying one midget. Two other I-class submarines were in the fleet outside the Heads, but these were carrying floatplanes for reconnaissance. The midgets were truly submarines in all respects, carrying a two-man crew, weighing 42 tons, and not at all similar to the “human torpedoes” that the British had developed and used on Commando raids. The Japanese midgets had originally been designed to operate with the fleet, and had a very fast underwater speed but a relatively short endurance. An essential prerequisite to copying Japanese signals was the ability to transcribe their “Katikana” Morse code, of around 57 different characters. This was done by quickly printing the characters from top to bottom of a ruled Naval signal pad. Later the characters would be transcribed into phonetics alongside to allow for transmission over a teleprinter. The Japanese operators were good, and as most of them used “sideswipers”; it was a struggle at times to keep up with them. Figure 4. An interior view (1942) of the DFG 12 showing Lew Sharman ZL2IC operating the set. The larger key in the foreground is a double current one on the long distance landline to Auckland and Waipapakauri D/F stations. The line could be extended to Suva D/F when required by activating an alarm (long dash) at Auckland Cable Station. The Goniometer unit is in the background, and bearings were determined by rotating the pointer to find the null point of the signal and reading the relative degrees off the circular scale. It is interesting to note that messages from Japanese Merchant ships were being intercepted and copied at Awarua Radio from March 1941, nine months before the Japanese entered the war. Similarly, the Australians were early in the field with the interception of Japanese signals, but their initial information was viewed with scepticism by commanders and the advice not always acted upon. This was especially true prior to the air raids on Darwin and Townsville, when ample warnings were given. It was not until General MacArthur arrived in Australia in April 1942, and with his awareness of the value of the signal interception unit at Corrigidor, that full use was made of the information obtained by interception. Signals from the major Japanese base at Rabaul in the Southwest Pacific were copied, day and night, by Awarua Radio. Rabaul was equi-distant between Tokyo and Awarua and the signals were steady and consistent. This huge Japanese base was completely devastated by bombing, and had been bypassed by the Allied advance. The garrison was virtually starving, living in caves, and endeavouring to exist on large vegetable gardens. Their only source of supply was by submarine and this was a hazardous and limited operation. At the close of hostilities an estimated 80,000 men surrendered there. Looking back 50 years it seems incredible that the Japanese were not aware that their codes were insecure. Their move to invade Port Moresby in May 1942 would have been fairly predictable without any information from signal interception, but the ability of the US Navy to position their fleet to block them must have surprised them. The resultant Battle of the Coral Sea put an end to Japanese southward expansion. Figure 5. 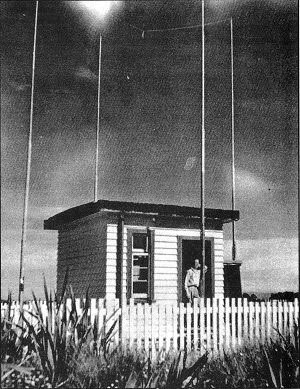 An exterior photograph (1942) of the Marconi G 12 Radio Direction Finder at Awarua Radio ZLB. The equipment was designed on the Adcock principle, with vertical aerials at each cardinal compass point. The installation was in an isolated area, away from any other buildings and sources of electrical interference. This set was later superseded by a DFG 24/2, a more modern version manufactured by Marconi. Four weeks later the decisive Battle of Midway took place, in which the US Fleet intercepted the Japanese Fleet near Midway Island in the vastness of mid-Pacific and effectively broke their offensive power. The Japanese at this stage, must have realized their signals were being read, and that the interception of their Fleet was no mere chance. However, they continued to use their codes; continued to transmit while at sea or in the air; seemingly unaware that they were supplying useful, sometimes vital, information to the Allies. The Japanese had one advantage in that they were using their Katikana Morse code, which needed a trained operator to intercept and copy. The disadvantage was that they had no option other than to use radio, which is open to interception, as there were virtually no secure marine cables back to Japan from the Pacific Island bases. Communication technology has made such giant steps forward that it is unlikely that such operating skills will ever be put to such uses again. The spy satellites and other high-tech detection equipment will reign supreme. However, it is reassuring to know that the deadly serious wartime activities of Direction Finding is now being put to recreational use by the Amateur Radio direction finding fraternity.